Monster Sounds have been looking to work with GENETIX for a long time being fellow south West residents. We are so glad we did as we have been blown away by the quality and Depth of this collection of sounds, FORWARD THINKING DUBSTEP is an adventure into the Deeper and more tech driven side of Dubstep, think of this pack as a foresight into a sound that will help move the genre to a different level. Producers looking for a different set of sounds to break away from the generic should investigate this pack, thats not to say this does not hit hard as it still maintains the mighty sound that we love GENETIX for, its just a new and exciting twist pushing the boundaries by 2 of the scenes MEGA talents. Matthew Sharp and Richard Dawson have had a meteoric rise in the Dubstep scene. 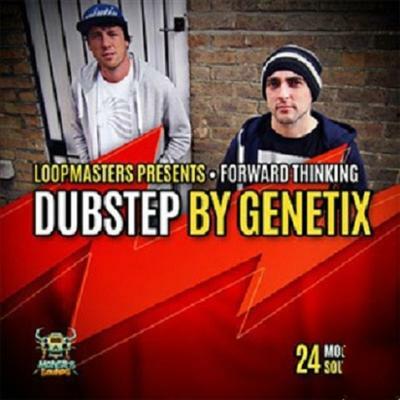 Their first production under the name GENETIX was their break through and somewhat trademark tune SQUID ATTACK which was immediately picked up by FUNTCASE and the rest of the CIRCUS RECORDS crew, with the track support list reading like a Whos Who of Dubstep, the tunes been on heavy rotation by FLUX PAVILLION, NERO, SUB FOCUS, SKRILLEX, and BOGORE, to name a few..Big names for a Big tune. Off the back of this explosion the duo have found themselves sought after as remixers stepping up to bring their sound for some incredible names. Remixing Kelly Clarkson's single Stronger, Timbaland feat. Pitbulls track Pass At Me, and Drumsound and Bassline Smith feat. Hadouken track Daylight amongst many others. Importantly and relevant for this sample pack, GENETIX have made some big steps within the deeper scene of late with releases on J kenzo's Artikal label and Walsh's biscuit factory label. This DEEPER side of the music is making waves gaining big support both in clubs and on the radio from the likes of N-Type, J Kenzo and Youngsta, Skream and Benga's radio 1 show for people looking out side of the tearing sound. Fresh from the GENETIX studio you get the building blocks for some great music, some of the key parts to this pack are the Driving synth loops, infused with a deep tech sound they roll out all day long, giving inspiration to not just dubstep tracks but we suspect cross genre. Theres a plethora of deep and dark fx to add instant vibe and intention to any ones productions. The drums are punchy and crisp, as you would expect from these guys, but the show stealers are the driving percussion top loops that add a whole different almost tribal flavor to any by the book dubstep drums, the pack has a generous 60 loops. Those who love the bass (thats all of us) wont be disappointed, the focus of this pack is more in the sub and low end department and theres some trouser flapping subs and dubbed out synth bass lines to compliment the other aspects of the sound set. The whole pack is backed up with many synth and bass multi sets so you can create your own riffs and flavors. Finally there is a huge stand out set of vocal loops and one shots from UK MC Skydro, adding both hype sections and phrases to give you more vibes to work with. In Detail expect to find 1.17Gb of 24 bit high quality samples. 60 Fx Loops, 20 Kick Loops, 20 Snare Loops, 60 Percussion Loops, 41 Music Loops, 18 Pad Loops, 20 Sub Bass Loops, 22 Synth Bass Loops, 20 Twisted Vox Loops, 10 Deep Bass Multis, 10 Sub Bass Multis, 10 Pad Multis, 122 Drum hits, 40 Synth Fx, 70 Skydro Vocal Shots & Phrases, 283 Rex2 Files and 44 Soft sampler patches for NNXT, Halion, Kontakt, SFZ and EXS24. Available conveniently in multiple formats and split packs. This ones a must for lovers of dubstep and all its facets, also for producers who wish to move into new territory to challenge and twist genre boundaries, pushing to new frontiers staying one step ahead of the crowd. Monster Sounds Forward Thinking Dubstep By Genetix MULTiFORMAT :December,3,2013 Fast Download via Rapidshare Hotfile Fileserve Filesonic Megaupload, Monster Sounds Forward Thinking Dubstep By Genetix MULTiFORMAT :December,3,2013 Torrents and Emule Download or anything related.